Located in the wild north and west of Scotland, in the county of Sutherland, is the most northerly group of Munros. 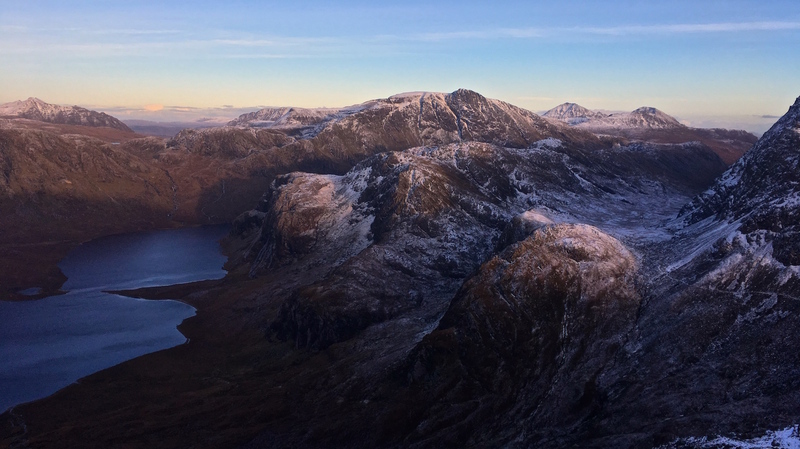 These far north Munros are a diverse group of hills, widely spread geographically and are a challenging objective for most hillwalkers looking to ‘compleat’ a round of the Munros, particularly considering just how far they are from any of Scotland’s population centres. The aim of this trip is to take you to the top of each of these hills. This is a challenging day, combining two shorted days into one with a short drive between the hills but with the reward of summiting both of the most northerly Munros in a single day. Ben Hope is the most northerly of all Scotland’s Munros and it really is an adventure to climb. Far from the nearest town or city this is a striking individual peak, with summit views extending all the way to Orkney! The ascent of the peak starts from Strathmore near the well-preserved remains of the Dun Dornaigil broch. The route winds up through some crags and then follows a broad ridgeline to the summit hand-railing the spectacular western cliffs of the hill all the way. From the summit, the descent can be varied by heading east to walk along the rim of the little visited eastern corries of the hill, with stunning views out over central Sutherland, before heading back down into Strathmore. This walk involves some steep ascent, mostly on paths but with a little trackless ground on the descent. The terrain can be boggy lower down but the upper part of the hill is mostly grassy and gives pleasant walking. Ben Klibreck is an isolated peak rising straight out of the moors of central Sutherland. It provides a fine, high-level walk with extensive views of the surrounding country. Starting from Vagastie Bridge, the walk follows a chain of subsiduary tops all the way to the summit. After some heathery terrain on the lower slopes, the upper part of the hill is covered in a mat of short-cropped heath giving pleasant walking. The summit of the hill is an impressive cone giving a final steep climb to reach the trig point. The easiest return is by the same route. The going is mainly on grass and heather and it can be boggy in places on the lower slopes. These are a pair of big hills sitting right on the edge of Assynt and directly on Scotland’s north-south watershed. Ben More Assynt is the highest of the far north Munros. Both hills offer fantastic views and show some of the fascinating geology that this area is known for. The south-east ridge of Ben More Assynt gives a pleasant scramble and adds a little extra interest to the day! Starting from Inchnadamph, the route goes up Gleann Dubh, passing nearby to the entrances to some of Assynt’s extensive cave systems, a unique feature in the Scottish Highlands. Turning away from the glen, a steep climb up a coire leads to a well-defined ridge to the summit of Conival. A rough, rocky ridge strewn with quartzite leads onward to Ben More Assynt. Turning south-east from here an increasingly narrow crest leads over a couple of subsiduary tops giving some fun scrambling with a little exposure. The end of the ridge opens out into surprisingly broad slopes which then give access down to the remote and wild Dubh Loch Mor tucked away beneath steep, craggy slopes. It is a rough traverse from here through the narrow pass of the Bealach Traligil and back into Glen Dubh but after that its not long before the view opens up to Loch Assynt and the path is regained for a pleasant walk back to Inchnadamph. This is a long mountain day covering rough, rocky terrain with some scrambling. There will also be some pathless sections in remote country. A wide variety of terrain type will be encountered on these hills. Most of the walking will be on paths but there will be some boggy ground, with rough pathless stretches & a little scrambling. A good level of fitness will be required. You will need to bring general hillwalking kit appropriate to the time of year as well as food and drink. A full kit list is available here. The suggested base for this trip is the village of Lairg. Situated in central Sutherland, it is perfectly placed in the centre of the far north Munros. The village itself is served with hotel, B&B and self-catering accomodation, a campsite, and basic services and can be reached by public transport using the scenic northern line or by road from Inverness. The Visit Scotland website provides further details.